Rent-A-Groom was originally published in 1994 . This is a novella with a little over a hundred pages. This is a contemporary romance. Gina finds her fiance in bed with her maid of honor. The wedding is off, but the honeymoon suite was booked and paid for so Gina checks in by herself. Then she finds out that her former fiance is there with his new wife. 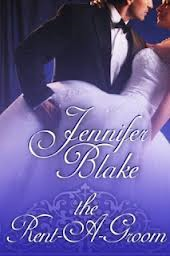 So, when a handsome man comes calling claiming he is a rent a groom, and knowing way to much about Gina's personal situation, she is initially wary, but the temptation to show off in front of her former lover is too great, so she goes along with the sham. Before long though she begins to suspect Race is not who he claims to be. Sure enough there are some sinister activities, but is Race involved? This is a cute story. The theme being that we have to take risk sometimes despite the fact we might get hurt. Things were wrapped up in a bit of a hurry, but there is a HEA.